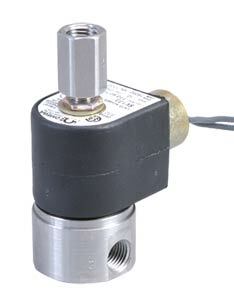 The SV130 Series direct-acting solenoid valves consist of a coil, plunger, and sleeve assembly. In a normally open valve, a plunger return spring holds the plunger away from the orifice, allowing flow through the valve. When current flows through the coil, a magnetic field is produced and it turns the stop into an electromagnet that attracts the magnetic plunger. This action compresses the return spring and brings the plunger against the orifice to prevent flow through the valve.